Lexengine: Notable Role (9/1000): K K Menon (Gulaal). There are some movies, which you often like to watch more than once and there are some movies, with such a great actors, which make you watch some scenes of the movie time and again. 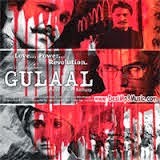 Gulaal is one such movie and KK Menon (playing the character role of Duggi Bana) is one such actor in this movie. His way of expression and the way he imbibes the character of the movie is unmatched. The way he shows his anger and his authority in this movie makes his performance in Gulaal best till now.